Joe Jackson can't spring the "I-Told-You-So" gag for the Tigers finished far below his hopeful expectation. The Free Press critic says "The one incident in the Detroit club's 1903 history that was responsible. more than anything else, for the large number of players that It became necessary to use was the Elberfeld blow-up. This affair also contributed more than anything else to putting the club out of the race, the frequently switched infield being responsible for many lost games and the blow-up figured especially In the St. Louis series in which Detroit won but six out of twenty games. Apropos of the Elberfeld case. 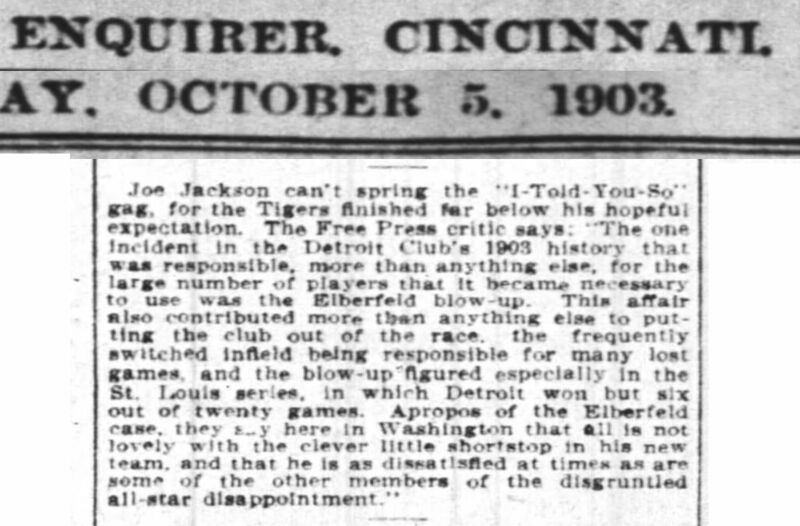 they say here in Washington that all is not lovely with the clever little shortstop in his new team, and that he Is as dissatisfied at times as are some of the other members of the disgruntled all-star disappointment."